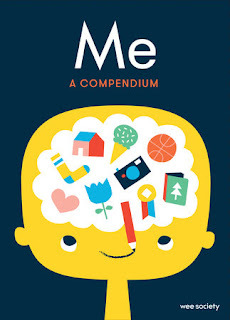 Me: A Compendium is an adorable journal for kids to share their thoughts, experiences, hopes and dreams. This journal is so much more entertaining than I had anticipated. I had ordered this book in hopes to give to my eight year old son to work on his writing skills but upon receiving it I found it would work better for my six year old. Although I am confident that my eight year old would enjoy this fun-filled journal, it seems to fit my six year old daughter's personality so much more. I thought that this book would simply include pages with story starter ideas with maybe some images but it is so much more than that! With large animated drawings of spaceships, children are encouraged to let their imaginations run wild as they write (or draw) about what they would see in space. The large, colorful pages allow for children to explore who they are and who they hope to be. I love the pages where they draw a picture of themselves as a baby, themselves now and as an older person. It certainly gets them thinking. Adorable. This would make a great gift or homeschool supplement for children in Kindergarten through 2nd grade. Disclaimer: I received this book from Blogging for Books for this review. All thought expressed here are my own.